First a note: It's a standard trick in the blogosphere that you can cover up your inexcusable failure to post for ... well ... a while (what do you mean I missed November?) by doing a handy site redesign. Thus the new site design. In truth, the standard TypePad theme that this blog wore for more than a year was getting a little threadbare. It was time for something a little cleaner and more ... gruntled. (OK, no more ellipses.) That said, you can expect some tweaking over the next few weeks. As always, I appreciate your feedback. And if you're reading this by email or RSS reader, click here to see the new design. We're hiring another lawyer at Shepherd Law Group right now, so we've been conducting interviews and meeting a lot of potential new associates. Which means shaking a lot of hands. Some shake well, and some shake less well. Turns out there's a skill to it. Maybe even a science. Gallup's study found no correlation between women's handshakes and either their "behavioral competitiveness" or body type. Unique to the evolutionary history of humans and all primates were complex adaptations to life in the trees. As a result, handgrip strength was featured prominently in patterns of brachiating, or moving through the canopy, as well as in minimizing the chances of falling. The handshake is one of the most critical opportunities to establish rapport and might be as crucial for job applicants as a strong résumé, Reiman said. Her book lists no less than 12 "wrong" ways to shake hands including the submissive handshake, the overly affectionate, the sweaty, the forward lean, but none as dreaded and as dreadful as the limp handshake. "The limp handshake feels like you're holding a lump of room-temperature chicken," she said. The way that will work with any person in any situation, according to Reiman, is to go toward the person, lean slightly forward, look them in the eye, extend the right hand, and simultaneously introduce yourself. 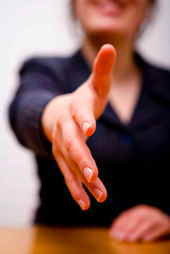 The whole handshake should not last more than two to three seconds. Sounds about right. So my question for you HR pros and managers: are your employees shaking hands properly, or they falling out of the trees (so to speak)? Hi Jay...and back with a vengeance. We're all still here and glad to be reading your excellent work. Cool redesign and logo. Nice. Nothing like a good handshake, my dad used to day. Thanks for this one. Nice new design! Glad to see a new post. A bad handshake - it happens so often that when someone has a good handshake I am IMMEDIATELY impressed with them. To me it is all about confidence. A firm handshake (not too hard) and a look in the eye says "I know what I'm talking about and you should listen to me".